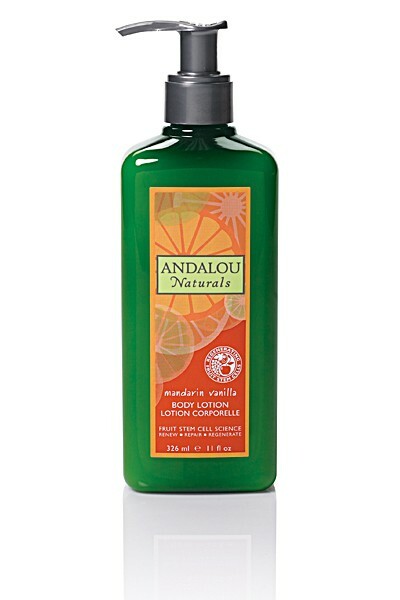 I received some Mandarin and Vanilla Body Lotion from Andalou Naturals to review. Andalou uses what they refer to as Advanced Fruit Stem Cell Science. By utilizing Stem Cells from specific fruit (ie: apple, grape, argon...etc) they are able to renew, repair and regenerate healthy skin. Apple cells stimulate healthy cell renewal and protects the longevity of skin stem cells. Grape stem cells protects the skins stem cells from UV damage and increases the skins UV tolerance. I must admit the product does soften my skin according to product claims. I haven't used it long enough to attest that it does in fact live up to all of the company's claims however. The scent is wonderful. I'm one of those "Smell this!" people... you know, the ones who abruptly stick smelly things in others faces. Everyone seems to enjoy the smell as much (and more in some cases) as I do. The orange oil is a nice additive, it gives the lotion a very uplifting presence. The downfall? The feeling the lotion left when I first put it on my skin took some adjusting to. I have been torturing myself trying to think of a good way to explain it and the closest example I can possibly concoct is this: You know that stickiness that is left on your hands sometimes after eating fruit? Strip away the stickiness... can you imagine the layer that is left? I feels slightly similar to that and I think the reason it bothers me so much is because I expect it to be sticky. Now this feeling goes away in about 10 minutes... After a few applications this was less and less noticeable to me. 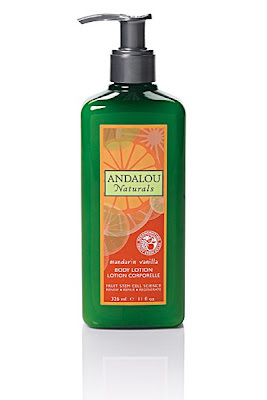 You can find Andalou Naturals and their wide array of beauty and self care products on their website. You can also connect with them on Facebook and Twitter. Disclaimer: I received this product to review. No other compensation was received. All opinions are my own honest opinions. This review was originally posted on my primary blog Music and Mommies.